A peptic ulcer is a sore on the lining of your stomach, small intestine or esophagus. A peptic ulcer in the stomach is called a gastric ulcer. 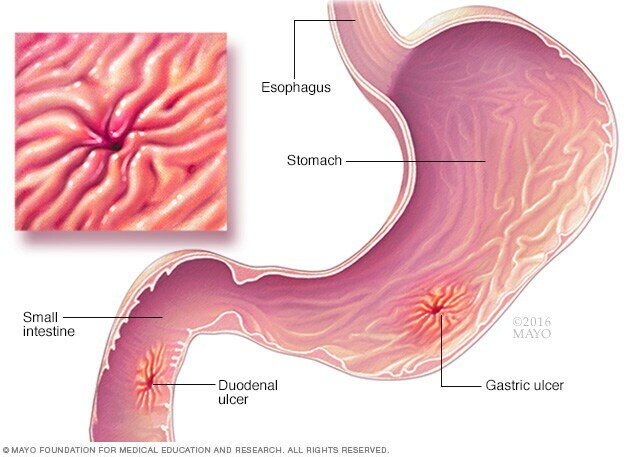 A duodenal ulcer is a peptic ulcer that develops in the first part of the small intestine (duodenum). An esophageal ulcer occurs in the lower part of your esophagus. The most common causes of peptic ulcers are infection with the bacterium Helicobacter pylori (H. pylori) and long-term use of aspirin and nonsteroidal anti-inflammatory drugs (NSAIDs) (Advil, Aleve, others). Stress and spicy foods do not cause peptic ulcers. However, they can make your symptoms worse. The most common peptic ulcer symptom is burning stomach pain. Stomach acid makes the pain worse, as does having an empty stomach. The pain can often be relieved by eating certain foods that buffer stomach acid or by taking an acid-reducing medication, but then it may come back. The pain may be worse between meals and at night. Nearly three-quarters of people with peptic ulcers don't have symptoms. See your doctor if you have the severe signs or symptoms listed above. Also see your doctor if over-the-counter antacids and acid blockers relieve your pain but the pain returns. Peptic ulcers occur when acid in the digestive tract eats away at the inner surface of the stomach or small intestine. The acid can create a painful open sore that may bleed. A bacterium. Helicobacter pylori bacteria commonly live in the mucous layer that covers and protects tissues that line the stomach and small intestine. Often, the H. pylori bacterium causes no problems, but it can cause inflammation of the stomach's inner layer, producing an ulcer. It's not clear how H. pylori infection spreads. It may be transmitted from person to person by close contact, such as kissing. People may also contract H. pylori through food and water. Regular use of certain pain relievers. Taking aspirin, as well as certain over-the-counter and prescription pain medications called nonsteroidal anti-inflammatory drugs (NSAIDs) can irritate or inflame the lining of your stomach and small intestine. These medications include ibuprofen (Advil, Motrin IB, others), naproxen sodium (Aleve, Anaprox, others), ketoprofen and others. They do not include acetaminophen (Tylenol). Other medications. Taking certain other medications along with NSAIDs, such as steroids, anticoagulants, low-dose aspirin, selective serotonin reuptake inhibitors (SSRIs), alendronate (Fosamax) and risedronate (Actonel), can greatly increase the chance of developing ulcers. Drink alcohol. Alcohol can irritate and erode the mucous lining of your stomach, and it increases the amount of stomach acid that's produced. Alone, these factors do not cause ulcers, but they can make them worse and more difficult to heal. Infection. Peptic ulcers can eat a hole through (perforate) the wall of your stomach or small intestine, putting you at risk of serious infection of your abdominal cavity (peritonitis). Obstruction. Peptic ulcers can block passage of food through the digestive tract, causing you to become full easily, to vomit and to lose weight through either swelling from inflammation or scarring. Protect yourself from infections. It's not clear just how H. pylori spreads, but there's some evidence that it could be transmitted from person to person or through food and water. If you need an NSAID, you may need to also take additional medications such as an antacid, a PPI, an acid blocker or cytoprotective agent. A class of NSAIDs called COX-2 inhibitors may be less likely to cause peptic ulcers, but may increase the risk of heart attack.